This report has been removed from TRAKnet so that it can be fixed by the developers without providing inaccurate information. It may be returned in a future release. 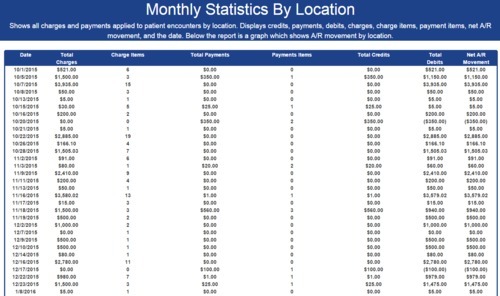 The Monthly Statistics by Location report is an Advanced Report which displays all charges and payments applied to patient encounters by location. This report will display credits, payments, debits, charges, charge items, payment items, net A/R movement, and the date. Table - The top of the report will display a table of information, showing the following: Date, Total Charges, Number of Charges, Total Payments, Payment Items, Total Credits, Total Debits, Net A/R Movement. The dates will be listed in chronological order, oldest to newest. 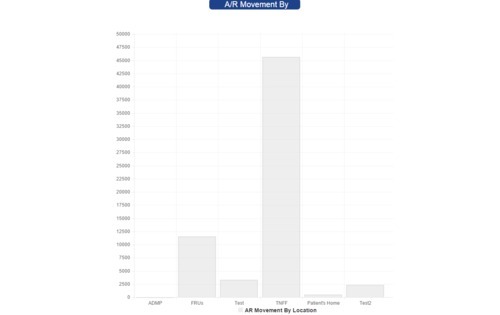 Graph - The bottom of the report will display a bar graph showing the A/R Movement by Location. The X axis will be the Location. The Y axis will be the dollar amount. Locations - Filter the report by one or more locations. Please note that if too many locations are entered into the filter, it may cause the graph to display incorrectly.